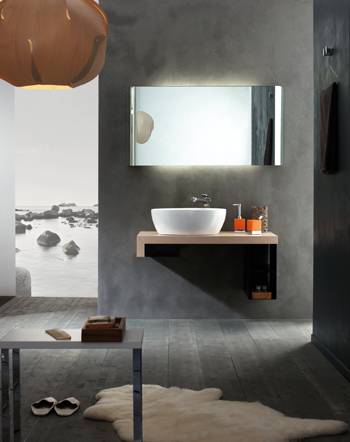 Founded in 1990, the company – which boasts a long history based on tradition and a constant search for the creation of new products – gives the bathroom a revival today with a completely new perspective. Valli Arredobagno goes beyond the bathroom concept, by focusing on innovative design using precious materials, accurate manufacturing and leading technologies. The most intimate place of the house therefore becomes a refined and elegant environment, aimed towards wellbeing. In the history of Valli Arredobagno, style and quality have harmoniously combined, giving total versatility to every collection, as well as a possibility of entering every spatial dimension. The ongoing renewal, which treasures the past and the mature experience, reinforces the excellence points and enlarges the collaboration with the main designers in this field, in order to create objects which satisfy different desires and needs. Thanks to the attention and care for details, Valli Arredobagno transforms a simple “ordinary place” into an intriguing refuge, enriched with light, colour and wellbeing. All the geometrical shapes which characterize Valli Arredobagno collections stand out by reason of their elegance, refined taste and complete versatility. It can therefore happen that the most rounded or sharp-edged shapes perfectly blend within the most varied environments, creating a harmonious ensemble and giving everyone the possibility of personalising their own bathroom. What joins Valli Arredobagno products is the capacity to successfully associate rationally and minimalism, classical shapes to eclectic lines in order to anticipate trends and go on surprising. Valli Arredobagno attests that the chrome treatment of its products is guaranteed 10 years. The brilliant grey shade tending to light blue is the typical colouring which each product takes after a workmanlike galvanic process of chrome plating and it meets the aesthetic demands of Architects, Interior Designers and of a more exigent and refined public. For its cleaning it is recommended to use only a soft, possibly water moist cloth. It is absolutely recommended not to use any products containing any kind of corrosive acids, especially hydrochloric acids, even if in small quantities. Valli Arredobagno declines any responsibility due to improper use of the products or non-observance of what above mentioned.